There are two artists with this name: 1). The Crystals were one of the most successful girl groups of the early 1960s, best remembered for the hit singles "He's A Rebel", "Da Doo Ron Ron" and "Then He Kissed Me". 2). The Crystals was also the name of a doo-wop group organised by the enigmatic Sun Ra in the mid-50s, as collected on the compilation Interplanetary Melodies on Norton Records. 3). If you are here for the Italian Progressive Rock band Crystals, they are not "The Crystals". Refer to the Crystals band page for more information. 1). The Crystals were one of the most successful girl groups of the early 1960s, best remembered for the hit singles "He's A Rebel", "Da Doo Ron Ron" and "Then He Kissed Me". 2). The Crystals was also the name of a doo-wop group organised by the enigmatic Sun Ra in the mid-50s, as collected on the compilation Interplanetary Melodies on Norton Records. 3). If you are here for the Italian Progressive Rock band Crystals, they are not "The Crystals". Refer to the Crystals band page for more information. In the late 1950s, Barbara Alston, Mary Thomas, Delores "Dee Dee" Kennibrew, Merna Girard and Patricia "Patsy" Wright formed The Crystals in high school under the leadership of Alston's uncle, Benny Wells. Soon, the quintet signed with Phil Spector's label Philles Records. Spector then chose Alston to be the group's lead singer, which made her very uncomfortable since she had a fear of singing in front of audiences. Their first hit was 1961's "There's No Other Like My Baby". This song's B-side "Oh Yeah, Maybe Baby" (featuring Wright on lead) and the following single "Uptown" were topical and socially-aware pieces about growing up in the ghetto. After the success of "Uptown", a pregnant Girard was replaced by Dolores "LaLa" Brooks. The next single was 1962's "He Hit Me (And It Felt Like a Kiss)", still widely remembered though only rarely played on the radio due to the touchy subject matter of spousal abuse. Sales were sluggish. Soon after "He Hit Me" flopped, Phil Spector began recording singer Darlene Love and her backing group The Blossoms under the name "The Crystals". Legend has it that the real Crystals were not able to travel from New York to Los Angeles fast enough to suit the LA-based Spector, who wanted to quickly record and release "He's a Rebel" (written by Gene Pitney) before anyone else had a chance to cover it and have a hit with it. The Crystals were unavailable, but Love and the Blossoms were also based in LA, so Spector recorded them and put the record out under The Crystals' banner. "He's A Rebel" is perhaps the Crystals' most well-remembered and beloved songs, and one of the most enduring of the girl group genre. It was also their only US #1 hit. The follow-up Crystals single, "He's Sure the Boy I Love", in actuality also featured Love and The Blossoms. The next single credited to The Crystals is one of the rarest -- and also possibly the strangest -- in rock music history. Reports vary as to the actual motivation behind the recording, but most agree that Phil Spector was looking for a way to annoy former business partner Lester Sill. What he came up with was a nearly six-minute song called "Let's Dance The Screw - Part I", which would be unplayable on 1963 radio. The record featured simple instrumentation (very much unlike Spector's famous Wall of Sound production style), repetitive lyrics, and Spector himself intoning the lyric "Dance The Screw" numerous times in a deadpan monotone. (The B-side, Part II, was more of the same.) The Crystals sang the song's repetitive verses, though it is unclear if these singers were the 'real' Crystals or The Blossoms. The single was never commercially released, and only a few copies are known to exist (all marked D.J. COPY - NOT FOR SALE). The record was apparently only created to be a bizarre sort of joke at Sill's expense, as a single copy was specially delivered to him in early 1963. Though it's unclear as to the level of their participation in "Let's Dance The Screw", the 'real' Crystals definitely began recording again under their own name in 1963. However, Thomas had departed to get married which reduced them to a quartet, and Alston stepped down from the lead spot giving it to Brooks. After "Let's Dance The Screw", the group's next release was the classic "Da Doo Ron Ron." According to Darlene Love, the track was originally recorded by The Blossoms, with Love on lead vocal. Prior to release, Spector erased Love's lead vocal and replaced it with a vocal by LaLa Brooks, although he kept the Blossoms' backing vocals in place. The song was a top 10 hit in both the US and the UK, as was the follow-up single "Then He Kissed Me" ? the first Crystals single since "He Hit Me" to feature all members of the Crystals as a definite group. Both "Da Doo Ron Ron" and "Then He Kissed Me" were penned by Spector with Jeff Barry and Ellie Greenwich. Despite the steady flow of hit singles, tensions between Spector and the Crystals mounted. 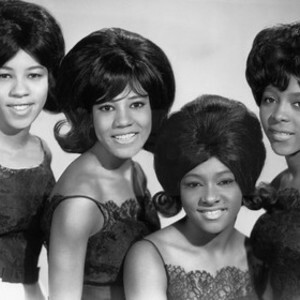 Already unhappy with having been replaced by Love and company on two singles, The Crystals were even more upset when in 1964, Spector began focusing much of his time on rival girl group The Ronettes. Two failed Crystals singles followed, before the band left Spector's Philles Records for Imperial Records later in 1964. 1964 also saw the departure of Wright who was replaced by Frances Collins; toward the end of that year Alston departed leaving the group a trio. They disbanded in 1966. They reunited in 1971 and toured widely in varying incarnations on the oldies circuit; they still occasionally perform today. Kennibrew is the only original Crystal who remained active throughout their touring from the seventies to the present.